When implementing a mid-market ERP system, it’s often suggested that the base ERP should provide 80% of the needed functionality and then the other 20% is provided by customization. The rationale behind this is that although GAAP (Generally Accepted Accounting Principles) is standard, each business is unique and has unique requirements in addition to GAAP, especially in modules outside of the core financials. All Sage ERP products offer quite high levels of customization ability. Generally we use this as a competitive advantage to make sales, since we can more closely match a customer’s requirements. However some customizations can lead to quite high costs and problems down the road (perhaps a version or two later). As more and more customers are looking to move to the Cloud, we need to rethink customization and what we are trying to achieve. This blog post looks at some of the problems with Customization and some things to consider when recommending these. These apply to both hosting current ERP’s in the Cloud as well as to how we have to think about Connected Services and Features as a Service (FaaS) in the Cloud. Cannot upgrade to a new version of the software because it means doing the customizations all over again. An initial product implementation fails because the costs and delivery of the customization go over budget and behind schedule. Some customizations cause system stability issues. For instance adding SQL triggers to the database. Then if the trigger fails, the transaction that invoked it fails with a really hard to diagnose error. Some customizations cause performance load problems. Perhaps a custom report or inquiry causes a SQL query to run that takes hours to finish, slowing everyone else in the meantime. In a hosted version everyone runs the same programs, so some customizations can prevent you moving to the cloud. Extra testing is required for every product update or hotfix to ensure they don’t interfere with customization. This restricts the use of things like automatic updates. Getting support and diagnosing problems. Customer support has a hard time diagnosing problem in and around customizations because they don’t know what the customizations are meant to do and what they might affect. As we look to move more customers to the cloud, we have to deal with all these customization issues. Some level of customization is necessary, so the question to some degree becomes how much? In the cloud we want everyone sharing the same set of programs, so no customized DLLs or EXEs. In the cloud we want everyone to immediately receive hotfixes and product updates, so customizations must be upgrade safe. Further when a new major version comes out, we want everyone in the cloud moved to this new version in a quick, transparent and automated fashion. Hence any customizations allowed in the cloud can’t prevent data activations and can’t require a lot of special testing for each new version. So what causes many of the problems above? A lot of customization can be a sign of an initial incorrect product choice resulting in trying to fit a square peg into a round hole. It can also indicate an overly eager to please sales team promising the product will do many things that it normally doesn’t. Plus many companies main line of business is developing customizations, so providing these is a major source of revenue. A big cause of problems with upgrading customization is the result of database schema changes in the core ERP. This is usually the result of adding new features or streamlining functionality for performance and scalability reasons. Often business logic changes can have unforeseen effects on customizations, even though the database schema doesn’t change, perhaps a customization relies on something in the way the business logic used to work. As solutions move to the cloud the nature and scope of customizations is changing. This affects both vendors like Sage, in how we need to make sure all customizations can be automatically updated and it affects customization consultants now that you can’t install EXEs or DLLs into the ERP or CRM system itself. So what do we do, since there are still vital business needs that need to be addressed? Maintain application API compatibility so customizations and ISVs continue to work. Limit schema changes so that we don’t break customizations or ISVs. Mostly just add fields or tables and even if fields are no longer really used, leave them in for compatibility. Provide tools to automatically convert anything beyond the database that is affected like Crystal Reports or VBA macros, so no additional work is required. Ensure that we can upgrade independent of database state, i.e. don’t require that all batches be posted or such things. Work closely with ISVs and Business Partners through alpha, beta and early adopter programs to ensure the entire ecosystem won’t be disrupted by new features and versions. More tightly control the customizations that are allowed in the cloud. Even for custom reports and VBA macros, have rules and monitoring procedures so that badly behaved ones can be found and removed (or fixed). When we are running our application in the cloud, how do we perform common integration type customizations? A great many of our clients create programs to feed data into and out of an ERP to integrate to things like perhaps a custom subscription billing service, a company shopping web site or one of any number of things. Since you can’t install EXEs or DLLs and even if you could do this via a VBA macros, chances are external communications would be blocked by a firewall, so what do you do? For these cases you have to switch to using Web Services. Which in the Sage world means SData. 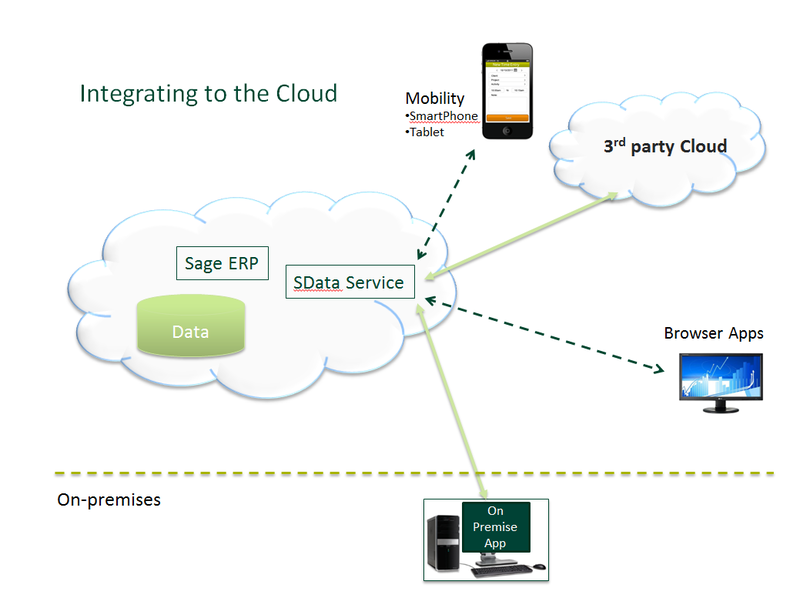 With SData you will be able to create Cloud to On-Premise integrations or Cloud to Cloud integrations. Basically you are removing the requirement that the two applications being integrated are on the same LAN. Changing the thinking on customization will take time, but the industry and customer expectations are changing. Sage and its Business Partners need to be more disciplined in how we all customize to ensure we don’t create longer term problems for customers. In the Cloud world these problems show up much more quickly than in the on-premise world. We have to re-evaluate the technologies we are using and re-evaluate how our common customization design patterns are changing. I tend to think once we get through some transitional pain, that we will come out the other side with a more powerful and more sustainable customization model that will lead to a better customer experience. 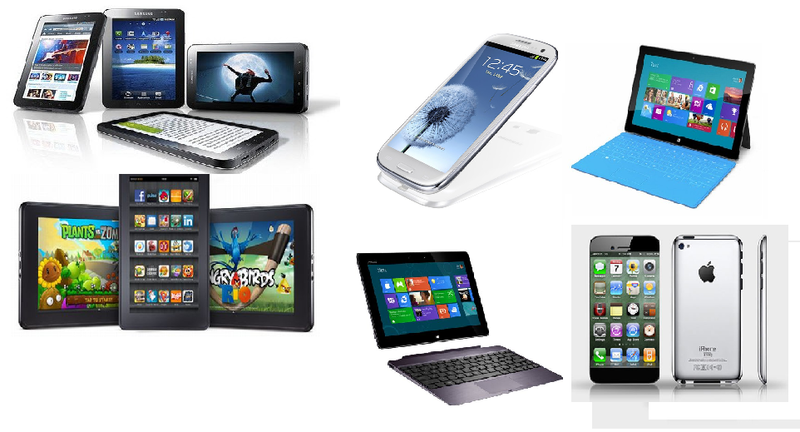 We are currently seeing a proliferation of devices being release from a new line of Tablets from Amazon, new tablets and phones from Samsung, the iPhone 5 from Apple and a certain amount of anticipation for all the Windows 8 based devices that should be coming next month. Amazon is quickly becoming a major player in the tablet market; they have branched out from just delivering e-book readers to having a complete line of high performance tablets at very competitive prices. 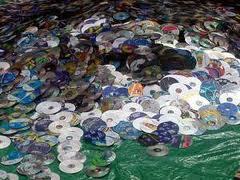 Amazon then makes most of its money selling books, music and movies to the owners of these tablets. These are Android based tablets that have been setup and configured with a fair bit of extra Amazon software to integrate seamlessly with the Amazon store. In the Android world, Samsung continues to deliver exceptional phones and tables of all shapes and sizes. Apple has just shipped the iPhone 5 and we would expect new iPads sometime early next year. Meanwhile Microsoft has released to manufacturing Windows 8 and devices based on this should be appearing on or after October 26. With each generation of these devices we are getting faster processors, more memory, higher resolution displays, better sound quality, graphics co-processors, faster communications speeds and a plethora of sensors. With so many players and with the stakes so high (probably in the trillions of dollars), competition is incredibly intense. Companies are competing in good ways, producing incredible products at very low prices and driving an incredible pace of innovation. People are also competing in rather negative ways with very negative attacks, monopolistic practices, government lobbying and high levels of patent litigation. The good news is that the negative practices don’t seem to be blunting the extreme innovation we are seeing. We are getting used to being truly amazed with each new product announcement from all these vendors. Expectations are getting set very high at each product announcement and launch event. There is collateral damage with once powerful companies like RIM or Nokia making a misstep and being left in the dust. But overall the industry is growing at an incredible pace. Amazing new applications are being developed and released at a frenetic pace for all these devices. They know where you are, what you are doing and offer advice, tips or provide other information. There are now thousands of ways to communicate and share information. They all have deep integrations with all the main social media services. They communicate with natural language and high levels of intelligence. Many of these devices are extremely powerful computers in their own right. The levels of miniaturization we’ve achieved is truly astounding. These devices are all very different, but what they share is that they are all connected to the Internet. 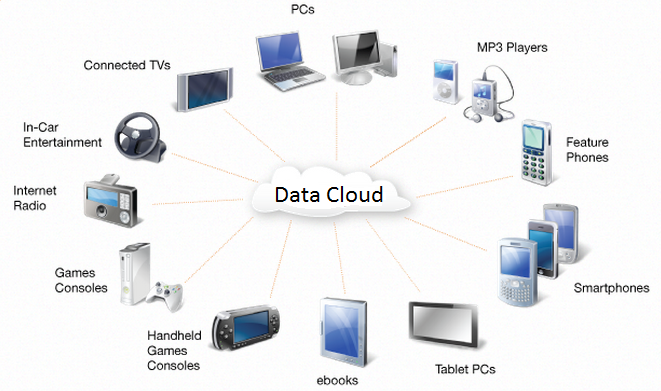 We now access all our data and the Internet from many devices, depending on what we are doing. We many have a powerful server that we do processing on, we may have a powerful desktop computer with large screen monitors, we may have a laptop that we use at work or at home, we may have a tablet computer that we use when travelling or at the coffee shop, we all have smart phones that we rarely use to phone people with, we may have a smart TV, we may have a MP3 player and so on. The upshot is that we no longer use exclusively use one computing device. We now typically own and regularly use several computing devices; it seems most people have a work computer, a home computer, a tablet and at least one smart phone. People want to be able to do various work related tasks from any of these. So how do we do this? How do we work on a document at work, then later we get a thought and want to quickly update it from our phone? Most of these devices aren’t on our corporate LAN. Typically we are connecting to the Internet via Wifi or via a cell phone network. The answer is that we are no longer storing these documents on a single given computer. 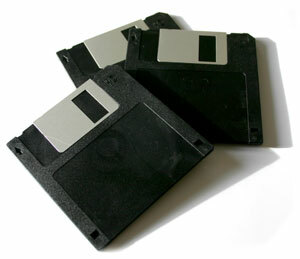 We are now storing these to a centralized secure cloud storage (like iCloud, GDrive, or DropBox). These clouds are a great way to access what we are working on from any network and any device. Then each device has an App that is optimized for that device to offer the best way possible to work on the document in the given context. Many of these services like Google Apps even let multiple people work on these documents at once completely seamlessly. Further many of these devices can keep working on our documents when we are off-line. For instance working on something on an iPad while on an airplane. Then when the device is back on-line it can synchronize any local data with the master copy in the data cloud. So the master copy is in the cloud, but there are copies off on many devices that are going on-line and off-line. Then modern synchronization software keeps then all in sync and up to date. Google had an interesting add for its Chrome notebooks where they keep getting destroyed, but the person in the add just keeps getting handed a new one, logs in, and continues working from where he left off. What we are ending up with is a powerful grid of computing devices accessing and manipulating our data. We have powerful servers in data centers (located anywhere) doing complex analytics and business processes, we have powerful laptop and tablet computers that can do quite powerful data input, editing and manipulation. Then we have small connected devices like phones that are great for quick inquiries or for making smaller changes. Our complete system as a whole consists of dozens of powerful computing devices all acting on a central data cloud to run our businesses. In olden days we had mainframe computing where people connected to a mainframe computer through dumb terminals and all processing was done by the mainframe computer that was guarded and maintained by the IS department. Then the PC came along and disrupted that model. We then had separate PCs doing their own thing independent from the central mainframe and independent from the IS department. Eventually this anarchy got corralled and brought under control with networks and things like domain policies. Then we took a turn back to the mainframe days with Web based SaaS applications. Rather than run on the corporate data center, these run in the software vendors datacenter and the dumb terminal is replaced by the Web Browser. This then re-centralized computing again. Now this model is being disrupted again with mobile devices. Where the computing power is back in the hands of the device owners who now controls what they are doing once again. The difference now from the PC revolution is that everything is connected and out of this highly connected vast grid of very powerful computing devices we are going to see all new applications and all new ways of doing things. It’s interesting how quickly these disruptive waves are happening. It’s really amazing what we are now taking for granted, things like voice recognition, you can just ask your phone a question and actually get back the correct answer. The ability to get a street view look at any location in the world. It’s an exciting time in the technology segment with no end in sight. In this articles I was referring to documents, which most people would associate with spreadsheets or word processing documents. But everything talked about here can equally apply to all the documents in an ERP or CRM system such as Orders, Invoices, Receipts, Shipments, etc. We will start to see the same sort of distributed collaborative systems making it over to this space as well. 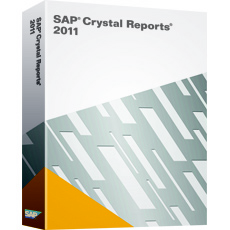 With our Sage 300 ERP 2012 release we updated our Crystal Reports runtime to the newest Crystal 2011 runtime (SP3 actually). The intent is to move to a fully supported version of Crystal Reports, so as they adapt to things like Windows 8 and Windows 2012 Server, we know we are fully supported and can get updates for any problems that show up. Plus it means that people customizing reports can take advantage of any of the new features there. For reports you can print to preview, print to file or print directly to a printer. Then we have various options for printing from various web contexts like Quotes to Orders. You can drive reports from our regular forms, or you can write VBA macros that automate the reporting process. This blog post is really for people that are controlling printing reports programmatically and are more affected by the changes in the Crystal runtime and more specifically changes in the Crystal Reports API. Our intent was that people performing customizations will use our API to drive Crystal Reports. Then your programs are upgrade safe since we maintain compatibility of our COM API. However it turns out that quite a few people have automated the report process by writing to the Crystal COM API directly. This then leads to a problem because Crystal dropped support for their COM API. Not only did they drop support for it, but they removed it completely from the product. Hence anyone that is writing directly to the Crystal COM API will be broken by the Sage 300 ERP 2012 release. At least for new installs. If you had an older version and don’t un-install it, then you can still use the older version of the Crystal runtime (since it will be still there), but that isn’t a good long term solution as people upgrade computers and go to newer operating systems like Windows 8. Crystal Reports now only supports a .Net Interface and a Java interface. For this version we had to change our internal interface to Crystal from COM to .Net. (The newer Web portal parts use the Java interface and so were ok). It appears that one of the common reasons to go to the Crystal API directly is to print to file without any manual intervention. Often if you choose File as a print destination then we prompt you for the format and then prompt you for the file name to save to. People want to set these programmatically. Our API does have the ability to do this in a couple of situations. Below is a macro I recorded to print O/E Quotes. I deleted any extra code, like the error handler to make it a bit more compact. Then I edited the destination and format to change the print destination to PD_FILE and the format to PF_PDF. rptPrintSetup.DeviceName = "HP LaserJet P3010 Series UPD PS"
Basically this technique will silently export to PDF files. The Format member also accepts PF_RTF which will export silently in RTF format. The file they export to is specified in the PrintDir property. If this is a folder, the filename will be the same as the report name, if it’s a filename, it will be that (make sure you get the extension right). You can also export silently to HTML format by setting the Destination to PD_HTML. For HTML if there is one file then the PrintDir specifies the filename, but sometimes HTML required multiple files, in which case it will use the PrintDir as a folder name. These are a few ways you can print reports to a file silently without user intervention. “@SELECTION_CRITERIA”: PESetSelectionFormula (job, asParamValue). This parameter is changed into the API to set the Selection Criteria in the report. To set the selection criteria in the designated subreport. “@SELECTION_ADDCRITERIA”: will add the parameter specified to the selection criteria that exists inside the report. Each instance of “table” will be switched to “name” before each PESetNthTableLocation call. This is done for both the main report and all subreports. You must put the table and name in quotes or the parameter will be rejected. Table names are not treated as case sensitive. “EMAILSENDTO”: The call will be set the email address when you are using PD_EMAIL. This will suppress the popping up of the address book dialog. “EMAILSUBJECT”: The call will be set the email subject when you are using PD_EMAIL. “EMAILTEXT”: This parameter will be set the email body when you are using PD_EMAIL. “EMAILPROFILE”: This parameter will be set the email profile when you are using PD_EMAIL. “EMAILPROFILEPWD”: This parameter will be set the email password when you are using PD_EMAIL. This password will be used to sign-in to MAPI. The following are some parameters that if you create them in your report, then the system will automatically set them without you having to do any programming. “ACCPACUSERID”: The Sage 300 User ID. “ACCPACSESSIONDATE”: The session date from signon. “ALIGNMENT”: The current alignment option. “REGIONALFMT” : The current regional format. We went through this Crystal API pain once before when Crystal dropped their DLL interface (crpe32.dll). At that point we had to change all API access over to COM. At that point we had similar issues due to various people using the DLL interface and now having to re-code for the COM interface. At that point we did add some functionality to our API, namely we added the TABLENAME special parameter, so that a number of people could start using our API. Hopefully most people can switch from using the Crystal COM API directly to using the Sage 300 ERP API, however if something is missing, please comment on this blog, so we can consider expanding our API in the future. I’ve already gotten a couple of requests to add silently exporting to Excel format in addition to RTF and PDF. Keep in mind that like we have gone from DLL to COM to .Net, chances are in a few versions, the Crystal API will change again (perhaps to a REST web services API) and we will have to go through this again. Yes, Sage 300 ERP 2012 has been “Released to Manufacturing”. In a way this is really a “Release to Marketing”, since we don’t really manufacture much anymore, it gets posted for download and then sales and marketing takes over. I think everyone prefers keeping the acronym RTM rather than changing to RTW for “Released to the Web”. 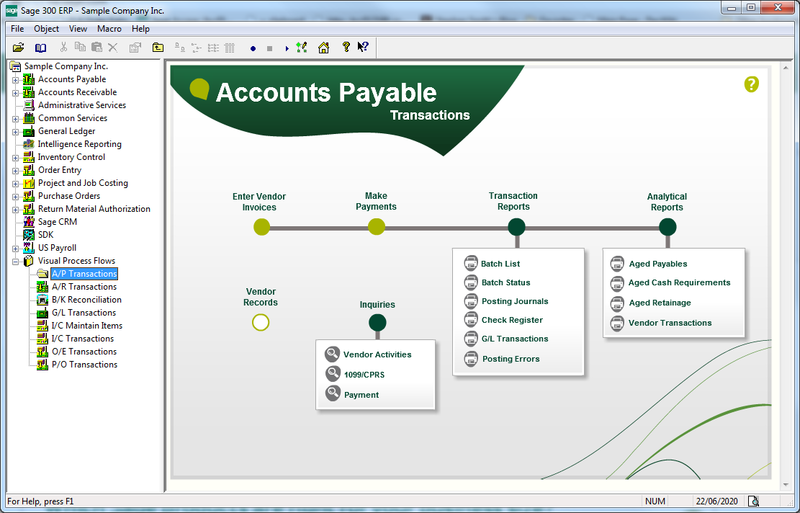 I previously summarized all the great things in the release in my Sage 300 ERP 2012 posting. It’s been a lot of hard work and a tumultuous journey since we release 6.0A at the end of 2010. But we are really happy with the release, it includes many useful new features as well as building on a number of foundations ready for future development. Now that we are RTM, business partners should be able to start downloading it on Sept. 5 and DVDs should be available by Sept. 18. Sage Accpac ERP is now release with the new Sage branding and is now Sage 300 ERP 2012. This means we now match the revamped Sage web site and fit in nicely with all the new sales and marketing material. Hopefully now we can fully leverage and build on the Sage brand to ensure people are familiar beforehand with our products. In addition our editions are changing. It would be confusing to have Sage 300 ERP 200 Edition 2012. So 100, 200 and 500 editions become Standard, Advanced and Premium Editions. Hence something like Sage 300 Advanced ERP 2012. When I started with Computer Associates on the original CA-Accpac/2000 project, manufacturing was a much bigger deal than it is today. In those days we produced a boxed product that consisted of floppy disks, printed/bound manuals, many special offer cards and the copy protection dongle all shrink wrapped in plastic. Back in the 90s we had quite a complicated schedule of when everything had to be submitted so that it could all come together on our release date. For instance manuals took 1 month to get printed, and disks took 1 week to get duplicated and labeled (if we were lucky). So the technical writers had to be finished a month ahead of the programmers. Similarly any included marketing material, as well as the design for the box had to all be submitted quite early. Back then we released on 3 ½ inch 720K floppy disks (they were actually in hard plastic by this point). Each module took 6 or 7 disks, so you had a stack of disks for System Manager, a stack for General Ledger and so on. Generally a single 720K floppy was quite a bit more expensive than a blank DVD is today. (In fact the first version of Accpac was released on 8” floppies for the North Star CPM computer, but that was before my time). After we shipped the gold master floppy disks off to manufacturing, we still had one week to QA while they were being duplicated. We would continue regression testing through the week looking for any more serious issues. If something was found, it was quite expensive, since usually any manufactured floppies were thrown away and new ones were duplicated. For a while we produced 5 ¼” floppy disks which were available by demand. With version 3.0A we switched entirely to CDs, but we still shipped one module per CD. With CDs it then became practical to provide things like PDF versions of manuals on the CD along with other extras that were impractical on floppy disks. One thing with having all the modules on separate CDs was that we could stagger the release, so we would release first perhaps SM and the financial modules then the operation modules a few months later and the Payroll modules a few months later still and various other things even later. The end result being that when we first announced RTM on a version, then it would be nearly a year before all the modules, options, integrations, translations, etc. were all fully released. Now there is only one RTM for a version and this RTM includes everything on one download image (or one or two DVDs). This includes all ERP modules, all documentation, all options products, translations in five languages and all integrations (like CRM and HRMS). So now when we RTM, a customer knows that all Sage components they need are ready and they can go ahead and start the upgrade process. We also work with all our ISVs to try to get their products certified for the new version as quickly as possible. These days everything is on-line, so the web site needs to be ready to link to the new release and then we provide the download images that are posted there. We still produced a gold master DVD, since people can order these if they want them (for a fee). Although not visible outside of development, we also run our release cycles quite differently now than we used to. In the early version all the coding was done first, then when we decided it was code complete we threw it over the wall to QA and went through a long find and fix bugs phase. Generally we shared QA with Sage 50 Canadian (then known as Simply Accounting) and one product was QA’ed while the other was coded. Now we use an Agile development process and QA is involved from the start and there is no separate development and QA steps. Nothing is considered code complete or done until it is fully QA’ed and documented. Generally this lead to more accurate schedules and higher quality products. 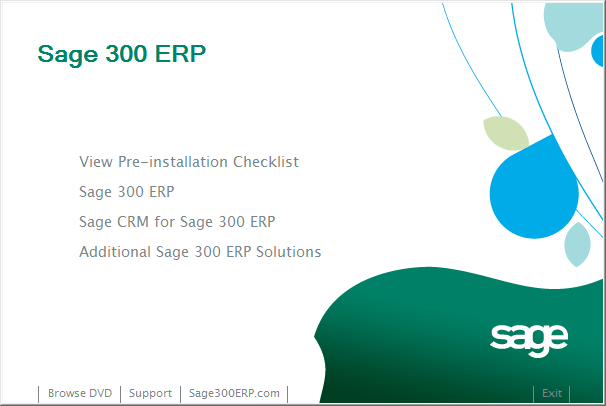 We are very excited to be releasing Sage 300 ERP 2012. We hope that people upgrade to it and enjoy using it. We are also excited to be starting work on the next version which also looks very exciting.